Back in the day before tofu was really mainstream and vegetarianism the new “in” thing, I was suffering away in Irmo, South Carolina deprived of all of the wonders of soy and wheat gluten. Even worse, I was oblivious of my deprivation. Then my brother moved to Washington, D.C. and Vegetable Garden on Rockland Pike came into my life. Raj would get an order of Kung Pao Tofu to go and carry it on the flight all the way home to South Carolina. Spicy kung pao sauce with the mildest of sweetness. Deep fried tofu. And crunchy asparagus and peanuts. It wasn’t the first time and wouldn’t be the last time that my family would go to great lengths to bring good food to one another. Rajat used to bring vegetarian sushi back to Boston from business trips to New York. My brother and I occasionally mail my sister some life changing ingredient that she can’t possibly find in Wyoming, Delaware. My dad mail orders mahani pickles that he used to eat in India growing up from the West Coast to their house in Atlanta. My mom packs food and makes me check it in my suitcase back to Brooklyn. Not only are we all food obsessed, we are obsessed with sharing it with each other. I’ve been thinking about that Kung Pao Tofu for awhile now. All of the vegetarian chinese restaurants in Philadelphia, Boston and New York combined haven’t been able to replicate that taste. It’s actually not on the menu at most. So I did what any sane person would do. I called Vegetable Garden to see if they would mail me some. Just kidding. I didn’t do that. But it might not be a bad idea. Make the Kung Pao Seitan: Place the seitan in a bowl and cover with the cornstarch, soy sauce and sesame oil. Mix well until all of the pieces are well coated. Let it sit for about 30 minutes to an hour. Heat two teaspoons of cooking oil in a wok. Cook the seitan until browned on all sides, about 8-10 minutes. Remove to a plate. Add additional cooking oil if needed. Add the ginger, garlic and red chili peppers. Saute for 3-5 minutes until fragrant. Add the asparagus, red bell pepper and nuts. Cook for about 10 minutes until the vegetables are softened. Add the seitan. Make the sauce: Mix together all of the sauce ingredients in a small bowl, whisking with a form to break up any clumps in the corn starch. Add the sauce and mix well until the seitan and vegetables are well coated. Reduce the heat to medium low and continue cooking for a few minutes. Serve hot over rice. 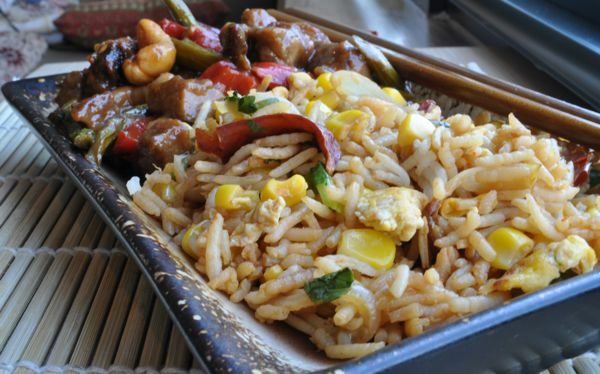 We had our Kung Pao Seitan over Spicy, Sweet Corn Fried Rice. The mildly sweet rice with creamy fried egg balanced the spicy Kung Pao Seitan. Heat about 1-2 cups of day old rice in the microwave. Heat a tablespoon of sesame oil in a wide skillet. Saute 2-3 dried red peppers and half of a yellow onion, sliced in the oil on medium heat until the onions get glassy, about 3-4 minutes. Add about 1/2 cup of frozen, yellow sweet corn to the skillet and cook for 5-8 minutes until tender. Push the onions and corn to the sides of the skillet. Crack an egg in the center of the skillet. Allow it to set slightly then scramble with a spatula until well done. Push that egg to the sides and repeat with a second egg. Add the rice to the skillet and mix well with the egg-onion-corn mixture. Drizzle with sriracha and stir. Drizzle with soy sauce and stir. You should use enough soy sauce that the rice has a light brown color and tastes slightly salty. Cook for another few minutes and serve hot. I garnished with cilantro, but that�EUR(TM)s optional. Peas would make a great addition to the rice as well. Wow thats delicious rice! So flavorful! This sounds so delicious!!! 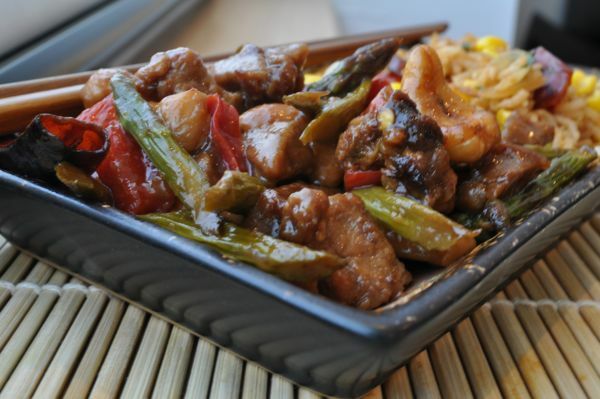 The Kung Pao Seitan is on my list of Things i MUST make!! But I don’t know how to make Sweet Corn Fried Rice. Would you share the recipe? Many thanks & Happy Cooking!! I love the way your family thinks! This looks WAY better than takeout- I need to make it soon! How good does that look! YUM!! Thanks for sharing your story. brought a HUGE smile to my face! Food obsessions are wonderful to read about! 3. You point out subtleties that are so very true of our family. Makes me love them even more. Heat about 1-2 cups of day old rice in the microwave. Heat a tablespoon of sesame oil in a wide skillet. Saute 2-3 dried red peppers and half of a yellow onion, sliced in the oil on medium heat until the onions get glassy, about 3-4 minutes. Add about 1/2 cup of frozen, yellow sweet corn to the skillet and cook for 5-8 minutes until tender. Push the onions and corn to the sides of the skillet. Crack an egg in the center of the skillet. Allow it to set slightly then scramble with a spatula until well done. Push that egg to the sides and repeat with a second egg. Add the rice to the skillet and mix well with the egg-onion-corn mixture. Drizzle with sriracha and stir. Drizzle with soy sauce and stir. You should use enough soy sauce that the rice has a light brown color and tastes slightly salty. Cook for another few minutes and serve hot. I garnished with cilantro, but that’s optional. Peas would make a great addition to the rice as well. Let me know how it turns out! This sauce is my regular rotation now. @Becca – I had such a long long week of work the week you left this comment. Your comment totally made my day and week! Thanks for the feedback. I am happy to hear it turned out so well. I just made it again this week but tried it with tofu this time. I have to say that it’s definitely better with seitan. I’m planning to post a recipe for Crunchy Cumin Seitan Tacos so check back soon. You might enjoy them. This is insanely good. I put in more asparagus & a couple of zucchini to make it more vegetable-y. Love your recipes! informatiÎ½e. I am going to watch out for brussels. I’ll appreciate Ñ–f you continue this in futÕ½rÐµ. Numerous people will be benefited from your writing.